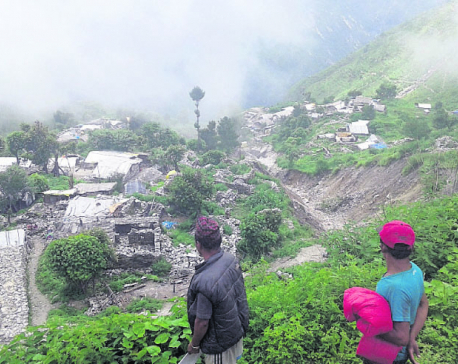 SINDHUPALCHOWK, June 27: Their makeshift shelter is visibly dilapidated. The plastics have plenty of holes and water easily leaks in from the corrugated sheets. 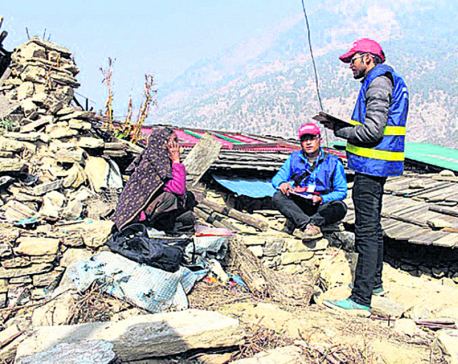 Hundreds of earthquake victim families in Sindhupalchowk continue to live miserable lives since the disaster claimed their houses in April 2015. Even this monsoon is going to be another big challenge for them, lament the victims. “Only few quake-hit families have built concrete houses,” said Somlal Tamang. “We have no idea how the people like us are going to face this monsoon. The hut has holes everywhere,” he added. Forty-year-old Somlal is worried about his octogenarian mother Torki, who just turned 80. Somlal, a local of Indrawati Municipality - 1, Simmalkavre, also has wife and kids to look after. He thought several times of erecting a better house, but to no avail. In fact, his body is not robust like that of others. His legs and hands are weak. According to his mother Torki, Somlal was like that ever since his birth. Since he is unable to work in the field, he sells goods. “I have a shop. I sell noodles, soap, matches and other goods. But the money I earn does not suffice for our family,” he said. Torki added that life would still be okay if the unpredictable earthquake had not hit them and claimed all of their hard earned belongings. The mother and son had toiled hard to keep the shelter clean when the monsoon flooded the area in 2015 and the following year. Both had fallen sick for days. Somlal laments that he has no more energy left to do the same hard work again to maintain the hygiene during monsoon. In addition, the family has some issues related to loan. After the government provided Rs 50,000 as the first installment for housing grant for quake victims, they were excited. However, the money was spent without using it in any meaningful work. He recalls giving some of the amount for road in his neighborhood. “Rs 10,000 was collected per household to bring road to our place. Later, I also took loan thinking that a house could be built. But now neither do I have money to pay off the loan nor can I start building house,” he said. No less painful is the story of Somlal's neighbor Sompal Tamang, 60. His seven-member family is managing their livelihood in a one-room hut, which is equally damaged. “This is going to be our third monsoon here in the hut. We never thought that we would be staying here for so long in such a pathetic condition,” he said. Sompal added that monsoon gives extremely tough time for them in the dilapidated hut. The first installment he received from the government was used in purchasing food. He has been looking for loan from landlords so that he could build a house. “If they trust me and provide me some loan, I could build a house. I would pay off the money later,” said Sompal. According to Sompal, it is not enough to feed his 'big' family despite having three pairs of oxen and some crop planted in his field. For more earning, he and his wife work at construction sites whenever they have time. “It's not that we are lazy. We work our heart out. Yet, it's not easy to manage a decent living,” Sompal said, adding that some of his children have health issues too. Somlal and Sompal are representative cases. Almost all of the quake-affected families have their own tale of struggle to share. Though the government promised their resettlement, the lengthy process has taken toll on their lives. While the victims continue to live pathetic life, the government does not have a clear picture and data on how many houses have been built so far and exactly how many are left. According to the district office of Urban Development and Building Construction Division, only 130 houses have been built in the district so far since the reconstruction campaign started. However, according to the chief of the district office, Dr Yubaraj Poudel, the latest data are yet to be complied. “Reconstruction could not accelerate. They are going to face huge inconvenience even this monsoon,” he said.